Magnetisation is transferred from 1H to 13Cα via cross polarisation and then selectively to the 15N using specific cross polarisation. A further specific cross polarisation step is used to transfer the magnetisation onto 13CO nuclei.The chemical shift is evolved on the 13Cα nuclei and 15N nuclei and then detected on the 13CO nuclei, resulting in a 3D spectrum. A 2D version of this experiment is also possible, in which the 15N evolution time is omitted. 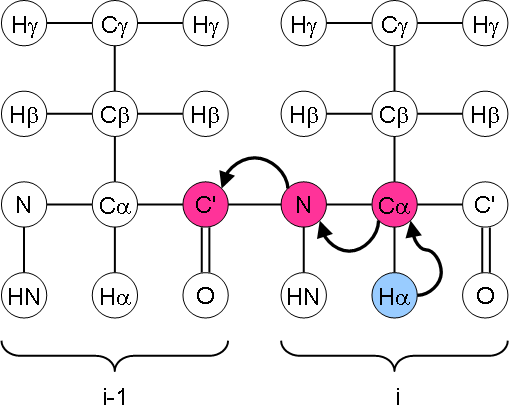 This experiment is a useful addition to the NCACX and NCOCX during assignment, providing useful quasi-through-bond links between two sequential residues (i.e. Cαi-Ni-COi-1). The main problem with this experiment is its low signal-to-noise. The three CP transfers tend to have fairly low transfer efficiency. On a sample which suffers from low signal-to-noise anyway, there may not be enough signal left to detect at the end of this experiment.